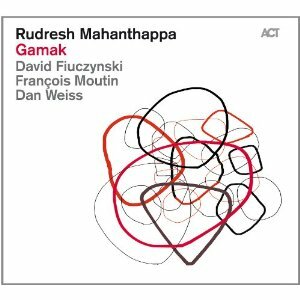 In listening to the alto saxophonist Rudresh Mahanthappa's latest offering Gamak I am struck by the passion for experimental immersion that is present throughout the endeavor. The music is an almost seamless integration of progressive musical ideas and eastern influenced musical tonalities. The publicists notes claim the name Gamak is derived from an Indian word for ornamentation in Indian classical music, a concept that according to Mahanthappa "... isn't random but is very specific and stylized and studied." Clearly the saxophonist had more than ornamentation in mind when he assembled this like-minded group of explorers. The band seems to be totally at ease, not only crossing eastern and western musical genres, but boldy blazing into further unexplored territories with the addition of the fusion-progressive element. The experimental guitarist David "Fuze" Fiuczynski is the futurist bridge here, delving into a myriad of effects using both freted and fret-less guitar necks, bolstered by his uncanny use of odd microtonal notes and his unquenchable yearning for creating new sounds. His virtuoso guitar sound, that melts seamlessly from exotic Middle Eastern sounds of the oud, to Indian sounds of the sitar, to raucous slide and heavy pulsing prog rock guitar chords, seems to magically meld over the raga rhythm based songs that Mahanthappa uses to launch this experimental music. 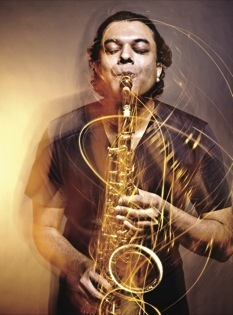 Not to be out done, Mahanthappa, who contributed all the compositions on this album, uses his alto as a vehicle for his kinetic energetic explosions of sound. Bassist Francois Moutin and drummer Dan Weiss are no strangers to these drone-like rhythmic pulses that drive these musical excursions. The wildly frenetic "Waiting is Forbidden" starts off this journey. If this doesn't induce an epileptic fit nothing will. The energy level of Mahanthappa's horn is intense throughout, but with a distinctive and precise intonation. Where Fiuczynski's guitar blurs boundaries between notes, Mahanthappa's horn is a beacon of light that pierces the darkness of the unknown with the intensity of a laser beam. The slinky "Abhogi" is the perfect vehicle for Fiuczynski's wildly serpentine guitar licks. Drummer Weiss is particularly adept at evoking tabla-like rhythms. "We'll Make More" has a middle eastern flavor. The precision with which these musicians play is quite extraordinary, especially given the lack of a melodic base with which to guide them. Perhaps the most mystical of the songs is the beautifully played "Are There Clouds in India" where Mahanthappa shows the most lyrical side of his alto. Fiuczynski lays down decaying chords in a gossamer accompaniment. The two lead instruments eventually have a go at musical conversation trading licks in a what appears to be a free improvisation that successfully tests the limits of each others musical telepathy. On the short piece "F" bassist Francois Moutin is featured. His bass solos are accentuated with breaks of repeated refrains by the band in sympathetic support. "Copernicus" features a brief splashy Weiss solo with a gushing waterfall of notes by Mahathappa. "Wrathful Wisdom" is a bizarre concoction that eventually features some stylized prog-rock guitar riffs by Fiuczynski. The ideas that come from this man's axe are completely from another world, unpredictable, exotic and searing. "Ballad for Troubles Times" features Mahanthappa on cascades of alto arpeggios that simply pour from his horn like billowing clouds of dry ice. Fiuczynski's guitar at times take on an almost Japanese sound. Mahanthappa's horn is perhaps at it's most beautifully resonant and soulful on this one. There is a solemn resolution here, it is as if he is playing ceremoniously for the passing of a favored friend or relative. The ending song "Majesty Of the Blues" is a piece that has elements of heavy metal and progressive rock with the rhythm team driving this over Fiuczynski's pounding chords and Mahanthappa's searing alto. A daring outing that blurs genres, Gamak needs to be listened to multiple times to get some of the superb nuances that are presented. With virtually no melodic base this one may not be for everyone, but this experimental excursion is at times refreshing and at times exhausting but clearly defies definition.